A report says Amazon is studying how to make its cashierless store work on a bigger scale. 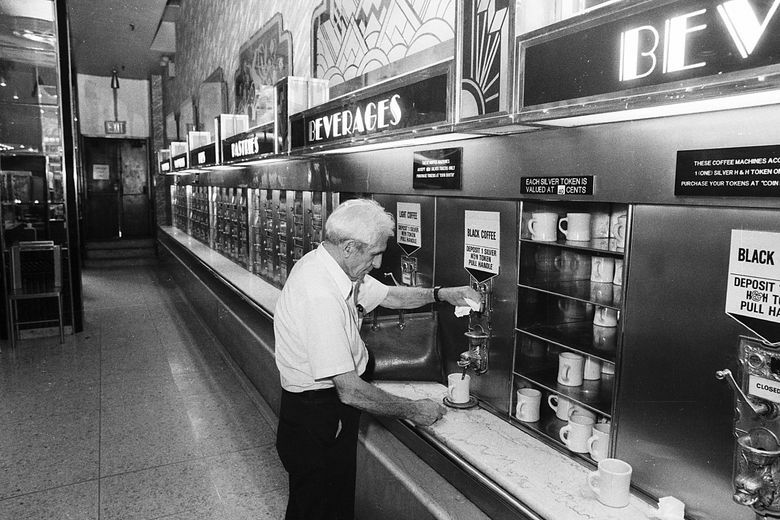 In 1912, the first Horn & Hardart automat opened in New York City. A combination of high-tech ingenuity and frugal convenience, the automat was a restaurant that cut out costly servers. Patrons fed coins into streamlined sets of vending machines to get main courses, side dishes and desserts among hundreds of choices. Still, critics pointed out that convenience came at a cost. Not only were waiters and waitresses made superfluous, but behind-the-scenes workers were paid poorly. They were also forced to work overtime. The AFL-CIO picketed the automats in 1937. Amazon Go stores carry a 21st century echo of the automat. A customer app, cameras and sensors allow the small outlets to operate nearly without humans, aside from the patrons themselves. The cashierless stores will soon be up to seven, operating in Seattle, Chicago and San Francisco. But something much more ambitious may be coming. Amazon is testing the Go concept for bigger operations, according to The Wall Street Journal. The company “is experimenting with the technology in Seattle in a larger space formatted like a big store,” the Journal reported, citing unnamed sources. “It is unclear whether Amazon intends to use the technology for Whole Foods, although that is the most likely application if executives can make it work,” the Journal said. “Amazon has previously said it has no plans to add the technology to Whole Foods.” Amazon declined to comment. Even without groceries, Amazon has led a sea change in retail employment. Nearly 15.9 million worked in the broad retail trade category as of September, a record high. But a deeper look inside the data reveals some sharp divergences. For example, employment in clothing, appliance, furniture and home furnishing, sporting goods, hobby, book and music stores is down. Department stores employed nearly 1.8 million in 2001. The number had dropped by a half million by 2017, when the data series was discontinued. The declines are a shift from the job growth traditionally seen in business expansions. One major cause is the rise of online shopping, where Amazon was a trailblazer and is a dominant player. Online’s share of total retail sales increased from 2.5 percent in the mid-1990s to 10 percent in 2017, and it continues to grow. To be sure, online sales create jobs, such as those found in Amazon’s massive “fulfillment centers.” But as a research paper from the New York Fed’s economics arm pointed out, the new jobs tend to be geographically concentrated. That hurts numerous communities that once benefited from brick-and-mortar retail jobs, especially at department stores. “Though total employment across department stores and e-tailers combined has not changed much at the national level since late 2012, there have been significant differences across counties: the areas that are losing department store jobs are often not the same ones gaining non-store jobs,” the report said. If Amazon finds the technological keys to heavily automate grocery shopping, the consequences could be a nine on the disruption scale. About 3.1 million Americans are employed in food and beverage stores, including about 2.5 million in grocery stores. This is already a sector that struggles with razor-thin margins and has been buffeted by competitive changes such as Walmart’s entry into groceries and the introduction of delivery by Amazon. What happens if the Go concept, writ larger, begins to kill jobs? Some important cautions are necessary. The grocery business is highly complex, and not as easy for a newcomer to clear cut as were independent bookstores. Even with the foothold of Whole Foods, Amazon can’t expect mighty Kroger and Safeway to roll over (although they would be under pressure to copy the low-employee model). Also, some sure things aren’t. Automats went out of style in favor of fast-food. 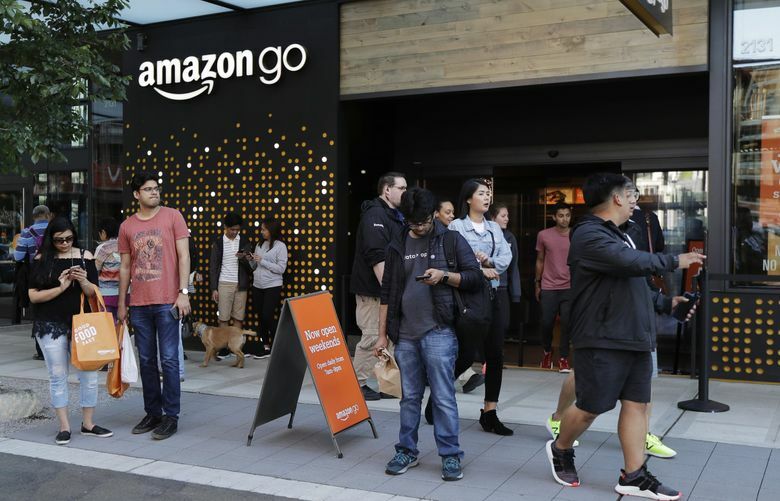 Amazon Go might remain a boutique for the technorati. Still, Amazon doesn’t do things small. For some time, experts have been warning about the employment fallout from a new era of artificial intelligence, advanced automation and robots. The losers won’t just be low-skilled workers, either, but increasingly highly educated groups in finance, law, medicine and media — even IT itself. Grocery jobs are often lower-paying, but not always so. Many are unionized and provide pathways to acquire skills and move up. A 2015 report from Oxford University and Citi showed how the upheaval of the digital age was already a major cause of rising wealth inequality and falling opportunity. This even though consumers have seen greater choice, speed and convenience, while shareholders have grown enormously wealthy. The report noted research indicating that as many as 47 percent of U.S. jobs are at risk from automation in the future. If, as these scholars claim, this time is different — that tectonic economic change won’t simply kill obsolete jobs and create new ones — then we face a considerable challenge as a society. Yes, unemployment is very low by historical standards. But the broader dangers to employment have only increased. They might not reveal themselves until the next recession. When that happens, faith in capitalism might be shaken beyond college-town rallies. An August survey by Gallup found more Democrats favoring socialism than capitalism (of course, it depends on how one defines socialism). With the nation already polarized and authoritarianism endangering former democracies in Europe, we can’t assume the strength of the liberal-capitalist system, especially in a crisis. To be sure, a world of AI and robots could mark a new golden age for humans, who could engage in art, leisure, contemplation and innovation. But that, too, would require systemic changes, such as a universal guaranteed income and Medicare for All. Also, big investments in such fields as green energy, transit and high-speed rail could create new jobs while helping combat climate change. This might require “set-asides,” where these and some other jobs are protected from automation. Whatever the approach, we can’t forget the virtuous cycle where one person’s spending is another person’s livelihood. Sacrifice all to the Moloch of convenience and you might end up on the altar, too.